In the last decade, backcountry skiing has really evolved. Changes in equipment allow us to travel more efficiently and have more fun, permitting more and more of us to explore areas further away. Similarly, the knowledge-base of the digital world has given us easy methods for research and planning. 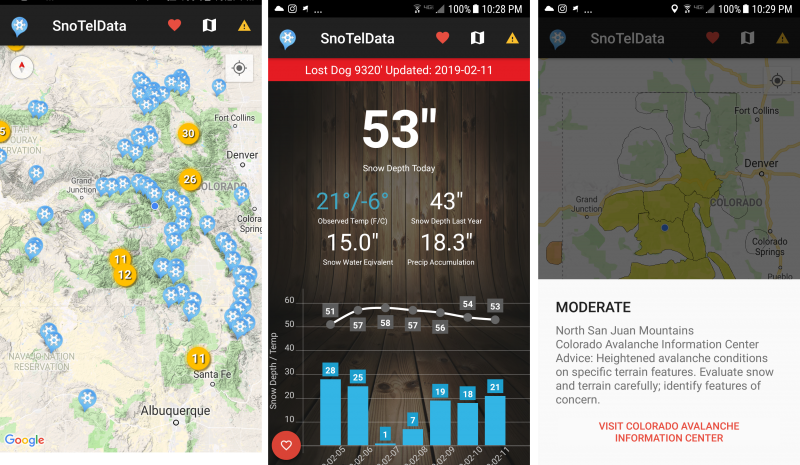 Whether you are a veteran or new to the sport of backcountry skiing, mobile apps have become essential tools to help in planning for outdoor adventures. 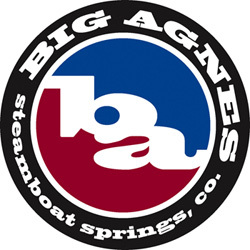 Below is a list of apps that every backcountry skier or snowboarder should use. 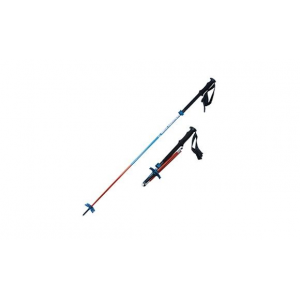 We use each of these on a regular basis to help in planning and navigating our way while backcountry skiing. Avalanche Forecasts mobile app displays information for most mountainous areas in the US and Canada. 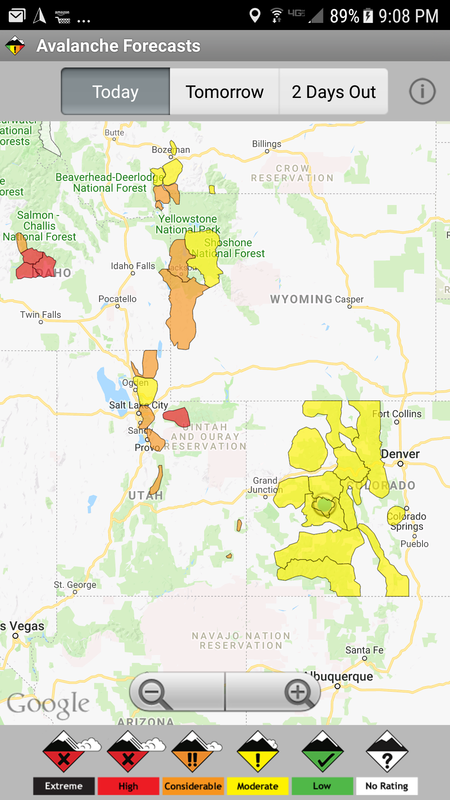 What this app does: Avalanche Forecasts displays the avalanche ratings for many regional areas where such forecasts occur throughout the western United States and Canada. The app is interactive, so if you click on a particular region with an avalanche forecast, a link directs you to the website of the avalanche center that created the report. For many areas that forecast for the following day or two days out, you can click on menu tabs to show those predicted avalanche ratings. This app is especially great if you are traveling to other areas you don’t backcountry ski in regularly. You have multiple avalanche forecasts easily accessible at your finger tips. Our tip – if you plan to backcountry ski outside your regular zone, use this app to start viewing avalanche forecasts for the areas in which you intent to travel. The more you can know about the history of the snowpack and avalanche problems for an area where you intend to backcountry ski, the better. Shortcomings of this app: The main shortcoming of this app is that links sometimes direct you to websites that are not always mobile-friendly. This is true of every region in Colorado, for example, as the CAIC website and CBAC (Crested Butte Avalanche Center) websites have pre-set widths that do not adjust to mobile viewing. Really, this is not necessarily the fault of the app as much as the websites themselves. In addition, the predictive forecasts for the next day or two days out do not always load. For example, in Colorado, the CBAC predictive forecast loads, but the rest of the state’s forecasts generated by CAIC do not. Furthermore, you need access to the Internet in order for this app to work.  Avalanche Forecasts does not have offline capability. Runner up: The CAIC has an app which shows forecasts for the entire state of Colorado and this IS mobile-friendly. So, for most zones in Colorado, this is a great fit. However, it does not show the Crested Butte Avalanche Center’s forecasts, or those from other states or Canada. 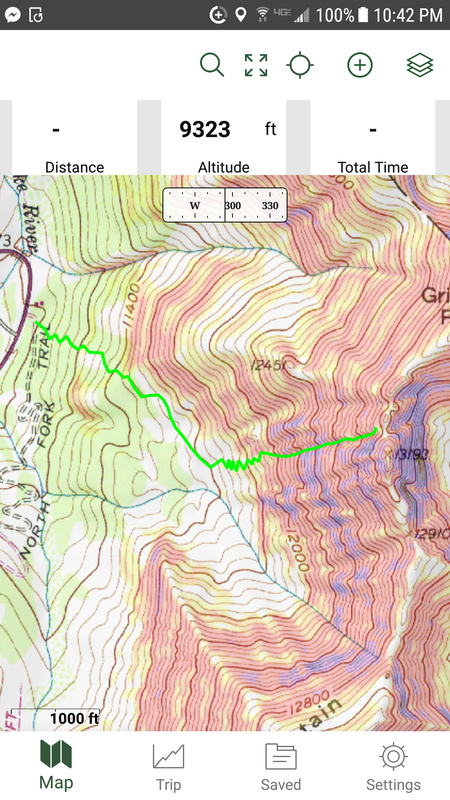 Packed with so many useful features, Gaia GPS is a GPS app on steroids. 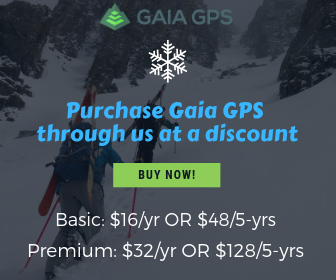 What this app does: Gaia GPS is packed full of information to help you navigate safely in the backcountry. It’s a GPS on steroids. Not only do you have a navigation tool to help you gather your bearings, but you can also use it to pre-plan your routes. 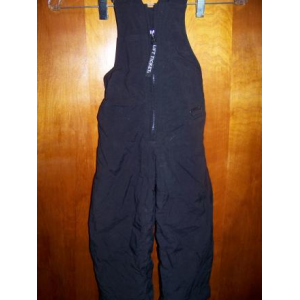 Different layers can be superimposed on a particular baselayer to help give you the information that you need. For example, a slope angle shading overlay can be imposed, using color codes to denote slopes within a certain range of angles. This can really help in route planning. If you have an iPhone, your version of the app can have a snow forecast overlay. Shortcomings of this app: The primary shortcoming of Gaia GPS is that it is not free. But, we don’t pay for any other apps other than this one because we truly feel this one is worth every penny. A membership will give you downloadable maps and a host of other features. But, if you want the slope-shading and snow forecast overlays, you need to go with the premium versions. You can get a discounted rate on both by purchasing through our affiliate link. One other shortcoming to mention lies in the slope-shading overlay. Keep in mind that this feature does not have a high enough resolution to track some cliffs, gullies and other terrain traps that can pose a risk. Furthermore, studies have shown that these overlays can have angle inaccuracies by as much as + or – 4 degrees. So, if you look at the yellow color coding and assume a slope angle is no more than 29 degrees (30 degrees and higher is prone to avalanches where, under 30 is not), take into account that the 29-degree slope could actually be as high as 33 degrees, or as low as 25. Last, this app can drain your battery while in the backcountry, so beware. We recommend carrying an extra battery pack for your phone. What this app does: SnoTel Data does so much! Primarily, you can view snowpack depth for various remote weather stations scattered throughout the mountainous areas of the western US. The app is interactive and when you click on the desired site, more detailed measurements open up. You can see how the depth has changed over the last week, the current temperature, snow-water equivalent, elevation, and the ambient temperature. You can also “favorite” specific sites to easily access from a list so you aren’t searching through a map every time. To cap it off, you can toggle to a different layer to view avalanche forecasts, similar to the first app we mentioned. SnoTel pulls information from remote weather stations throughout the US. Shortcomings of this app: While SnoTel Data has a plethora of data, so much data remains missing. For example, if you actually view a station on the SnoTel website, you can see much more information, including a 30-day table which shows average snow depth over the course of that many days, so you can see the larger trend over time. I wish the page on the app for each weather station linked externally to the respective weather station website. In addition, the avalanche forecasting part of this app is not nearly as good as Avalanche Forecasts mentioned above. Many area forecasts, such as the CBAC, are simply missing. 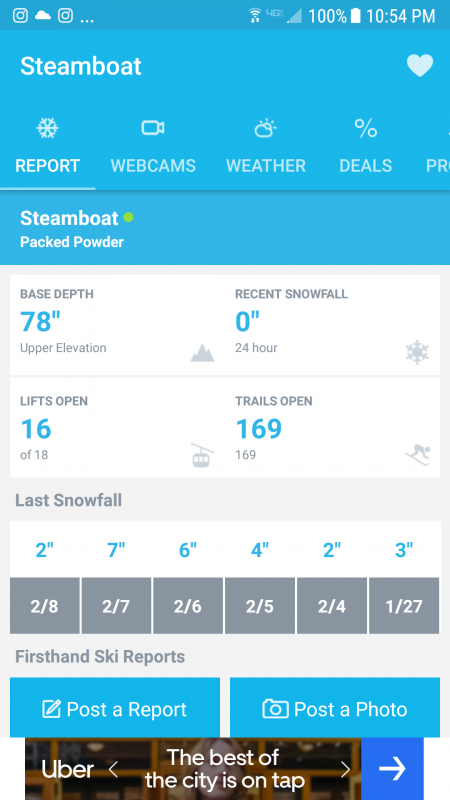 OnTheSnow gives you snowfall info and weather for nearly every ski area in the US, Canada, Europe, and beyond! What this app does: Sometimes the remote weather stations placed by the government are quite in the spots where you want. 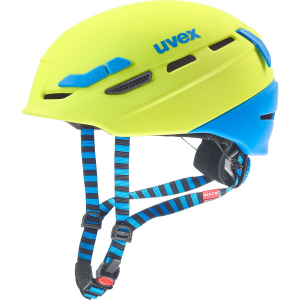 If you’ve spent time backcountry skiing or snowboarding in the mountains, you quickly realize that areas area all susceptible to unique orographic effects based on location and elevation. OnTheSnow gives you snow data for ski areas, which may be a better indicator for your desired backcountry ski zones. You can “favorite” ski areas to view in your list. When you click on the ski area you desire, it opens up a page where you can view base depth, recent snowfall, and the snowfall over the last week. If the ski area has a webcam, including a pow-cam, there are links to those too as well as current and future weather forecasts. This app has ski area data for most places in the United States, Canada, Europe and beyond. 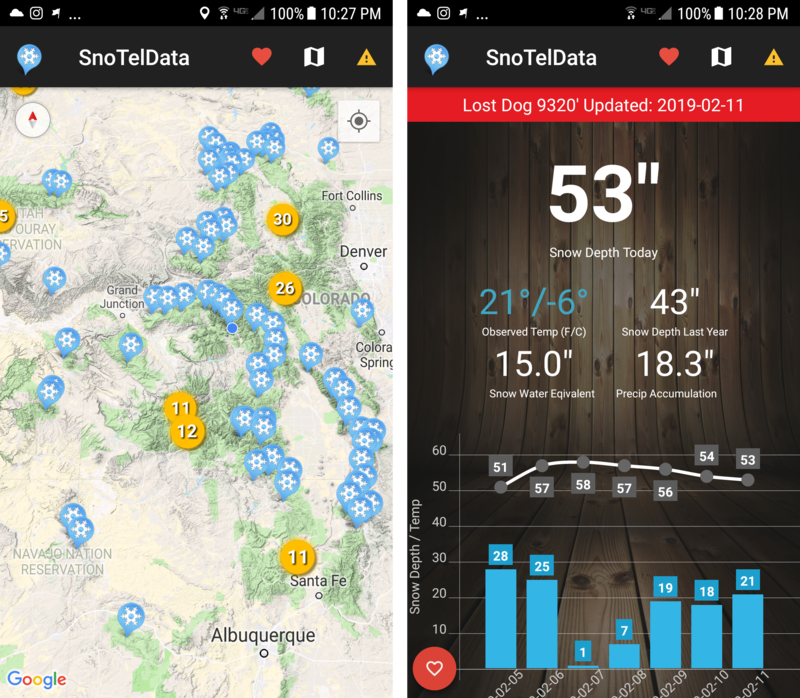 Shortcomings of this app: OnTheSnow focuses on ski area snowfall data which may not always reflect the same trends as nearby backcountry ski zones. Instead of having a map interface for a quick overview, you either need to search for your ski area of choice, or “favorite” it to see quickly on a list in the future. Last, elevations of the snow depth data are not reported. 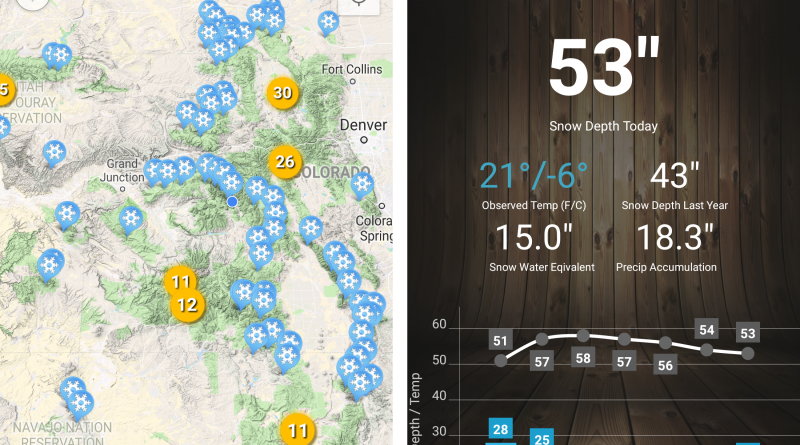 Runner up: Colorado Snow Map is also a great app for similar ski area data. Of course, this app only works for the ski areas within Colorado. This has a nicer interface using a map to show snowfall for various ski areas throughout the state. The map allows you to toggle different views, like 24-hour snowfall, 3-day snowfall, 7-day snowfall, and base depth. If you click on a resort, a page opens that shows this same data for the specific location as well as a table of new snow and base depth for the last several weeks, so you have a better idea of the last storms, etc. What this app does: This app takes weather information from the NOAA website and puts it into a mobile-friendly format for you to easily and quickly view. You can see the overall 7-day forecast for a location as well as view weather alerts and get notifications. 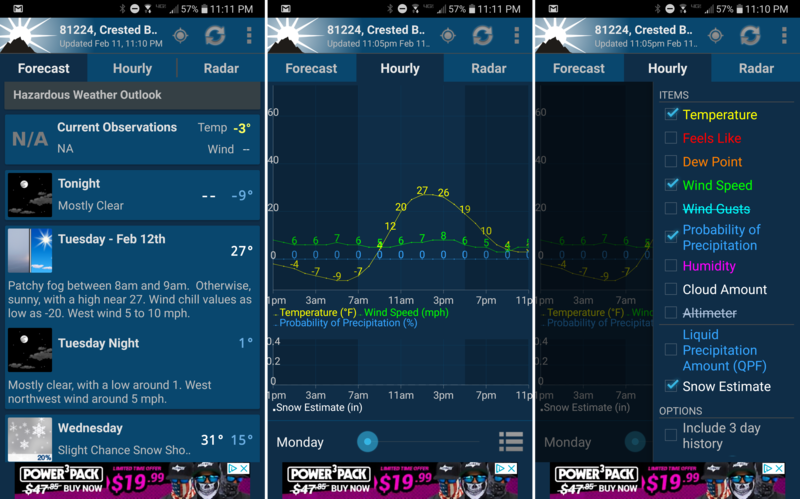 Weather geeks can nerd out on the hourly customizable weather graphs. One great perk is the radar imagery. Many detailed weather apps like this require subscriptions, but this one does not. NOAA Weather Unofficial app gives you all kinds of weather data including hourly changes and radar views. Shortcomings of this app: I prefer to obtain most of my weather information from NOAA because it tends to be the most accurate. When using the website, you can click on a specific place to get a pinpoint forecast for a mountain or valley, giving you a better idea of the forecast for backcountry areas. While this app does not have this kind of interactive map, you can search by city or town, or by mountain (ie. Mount Elbert), or pass (Ie. Monarch Pass, Loveland Pass). Valleys are a different matter, and much harder to search. In addition, if you do search for the mountains or passes previously mentioned, the app does not tell you what elevation the forecast is for. Is it at the summit? Or half way up? Or ¾ of the way? Last, when you search for a location, it automatically saves it to your favorites. The free version of this app allows you to only save 3 locations for free. Once all three are filled, you must delete one to even be able to search for another location. If you decide to use the paid version of the app, you can have a lot more than 3 locations. Runner up: To mention the words weather and snow without mentioning OpenSnow in this digital era would be a sacrilege. You can search for a ski town or mountain and get the forecast. You can also add places to your favorites so you do not have to search for them. One of the most useful features is the “Powder Finder”, which lists all the ski towns or mountains they forecast for in order of greatest most recent or upcoming snowfall. The main downfalls of this app are the inability to do pinpoint forecasts for other places other than ski areas. In addition, forecasts stop in spring, just when true ski mountaineering season is at its peak! Digital tools are incredible. We can now view recent snowfall and weather in areas all over the world and the backcountry. Avalanche forecasts are viewable at the touch of a finger. And navigation is made easy with Gaia GPS. These tools have drastically changed how we plan for backcountry skiing and have allowed us to have more successful and fun objectives that work with the weather and avalanche conditions. What mobile apps do you like to use to during or for planning your backcountry ski or snowboarding outings? The digital era has changed how we plan for our adventures. Check out these 5 apps that every backcountry skier or snowboarder should use! ← Thoughts on NOT Skiing in the Backcountry.